Allowing enough time to get ready for class, study for an exam, or complete an assignment can be tricky. The key is to always do what must be done first. This usually involves studying, reading, projects, and weekly homework assignments. Worry about what can be done later, after completing what needs to be done now. If you’re getting ready for a test, don’t check text messages, Snapchat, Instagram, YouTube, or start any Google internet searches. Enjoy the entertainment side of things after the task at hand is completed. This strategy reduces a lot of stress that comes with doing things last minute: waiting to study the night before, starting your paper the week it’s due, working on your presentation the morning of, etc. Try to stick to a routine or tentative schedule. This is because time management can be tough for some students. Mainly, because students overestimate the amount of time they have for a task and underestimate how much time it will take for them to do it. All of the student's professional meetings, such as counseling or tutoring, should be pre-arranged. Most students do well with structure, so meeting at the same time and on the same day works best. Students usually retain more information when they study in different locations. If possible, change the studying location from time to time. There are students that do better in a busy area – think of your local public library, the school’s library, Panera Bread, Starbucks, Barnes N Noble, worship center, community center, etc. Then, there are other students that know they must have silence. These students may prefer a bedroom, basement, home office, private study room, even their home patio, or sun-room. In case you didn't know, the best place to study is outside. So, try to change the study location when you can! You can put your phone across the room or in another room and leave it there. If you want to check your messages from your friends, you have to get up and walk to it. Students say that this significantly limits the amount of phone distractions. If this is too hard for you, set the timer for 15 minutes, and work as hard as you can during that time. When the timer goes off, get up, check your messages for one minute, and then get back to work. Playing songs by your favorite artist is fine for routine assignments that do not require too much. However, music should not be played when intensely studying for a big exam. Playing music can negatively impact long-term retrieval. 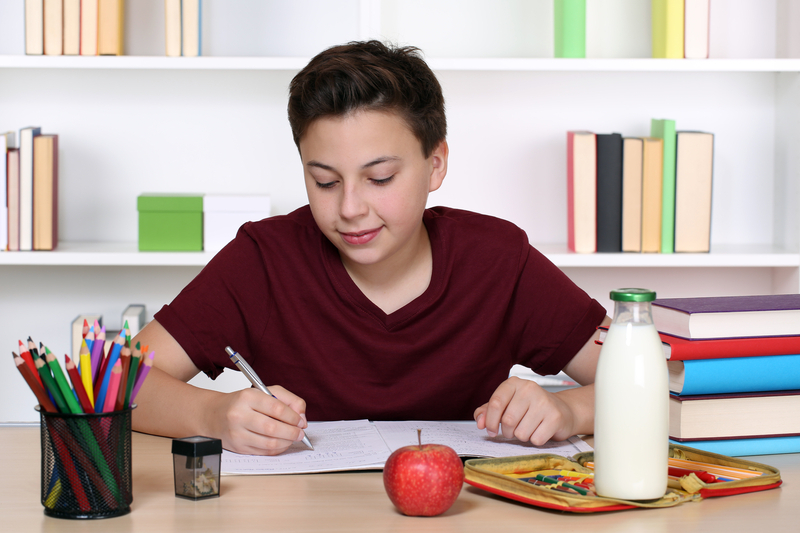 When students are having a tough time getting started with homework, it’s always a good idea to begin with an easy task, followed by a difficult one, and then an easy assignment again. Tasks that you record should be no more than 30-35 minutes. When tasks end up taking longer, students are far more likely to procrastinate and avoid doing it altogether. Every student should schedule a “binder and backpack sweep” session to help stay organized. Set aside 30 minutes each week and conduct a clean out. Sundays are perfect for doing this. This also lets the student plan ahead for the week – what’s due and when, starting a long-term assignment, and planning what to work on. Enter the 30-minute clean sweep on your phone calendar, monthly planner, room calendar, or make sticky notes to remind yourself. Active reading should be utilized when preparing for an exam. Active reading includes writing notes in the margins and highlighting pertinent information. As reading becomes more complex, these strategies help students to understand more advanced topics. Read one section at a time. After you’re done, go back and highlight the important information. The color of the highlighter does not matter at all. Yellow, blue, green, pink, or orange - just pick one! Use margin notes. Margin notes are another interactive way of studying. It’s better than just reading the information and moving along. In short phrases, summarize the main points in the margins of text books. Doing so, will help with retaining the information that was read. Engage in “self chat” at the end of each section. The student should ask, “What did I just read here?” or “What’s the takeaway from this section?” Self chat helps students comprehend what they are reading better. Find each heading, and change it into a question. Review pictures or charts and read the captions beside them. Hone in on the terms in bold; read these words to gain an understanding of the main idea. Check out the questions at the end of the chapter. Looking for an Academic Coach? Contact us for in-home tutoring support!